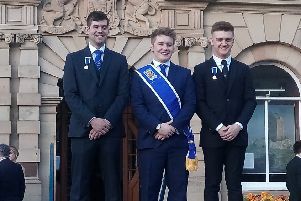 Hawick youngsters are being offered hope of following in the footsteps of the likes of rugby union internationals Stuart Hogg and Jim Renwick and becoming sports stars of the future by the news that a £40,000 fund is to be retained despite the imminent demise of the body in charge of it. Hawick Sports Initiative is to be wound up as it has decided it is no longer needed after playing a leading role in securing a series of improvements at the town’s Volunteer Park, including the creation of 2G and 3G sports pitches and new tennis courts. The charity was given £40,000 by Scottish Borders Council as a sinking fund to cover maintenance of the 2G pitch, but thanks to staff at Hawick High School helping out, it did not need to dip into that cash. Now it is shutting up shop, the initiative has secured the council’s agreement for that five-figure kitty to be transferred to Live Borders on condition that it is spent on improving the facilities in Volunteer Park. The Volunteer Park Sports Club Group will continue to represent the clubs that use the park. Initiative chairman David Davidson said: “I am delighted that we have been able to deliver sports facilities at Volunteer Park, and through this agreement, it is assured that any unused capital can be passed on for the next phase of maintaining the 2G pitch and to upgrade changing facilities at our new 3G pitch. Ewan Jackson, chief executive of Live Borders, added: “One of our priorities is to ensure that sports facilities in the region are of a high standard and widely available to all. Hawick and Hermitage ward councillors Davie Paterson, Ron Smith and George Turnbull visited the finished 3G facility at Volunteer Park last week and were enthusiastic about the prospects it offers for sport in the town. Mr Paterson said: ‘I’m absolutely delighted that after a lot of fighting for this at the council’s executive this has now come to fruition in Hawick. Mr Turnbull said: “This has truly been a win-win situation, in a spirit of working in partnership. “All of the groups involved have pulled together for the betterment of what could, and will, happen at the Volunteer Park, and here’s hoping that we can continue to improve the facilities for the benefit of all users. Mr Smith, alluding to the controversy that led to plans for a similar facility in Peebles being ditched, added: “Townsfolk in Hawick can take great satisfaction from the level of co-operation which has been seen. “There have been no disputes over the preferred site, and no disagreements between clubs and organisations which have not been sorted out through amicable discussion.